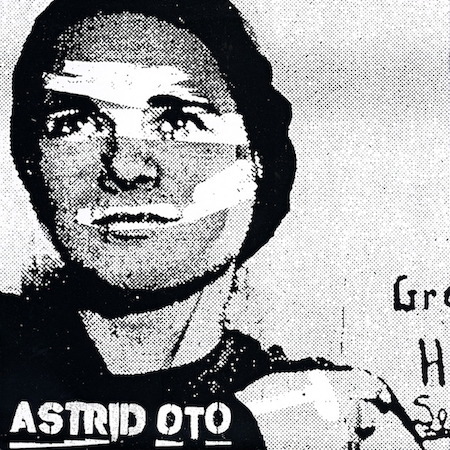 This is only Astrid Oto's second record, but it feels tense. With so many strong creative powers in one band, you knew eventually that it would end. There's an imbalance in the art, particularly. Cometbus designed the cover and inner art, but zinester Cindy Crabb only gets the labels? That seems odd. I would have loved to see some collaboration between the two styles. The clear red vinyl is a nice counterpoint to the black and white art, though. Yet, even the vinyl hints towards tension with the runouts reading "Too much reverb E.P." and "I told him to turn it down." The tension continues in the music itself. I feel like Cindy Crabb chose weird phrasing just to rebel against the fact that Cometbus wrote all the lyrics. Perhaps she is trying to wrest some control of the band from the notoriously cantankerous Cometbus. At any rate, the disjointed phrasing and contrasting male/female vocal work adds interest to the record, but doesn't quite provide those sing-along moments I tend to love. The highlight is the old-guy punk song "Torch Song" about passing the punk torch on to people who are messing it up. It's a nice play on the torch passing metaphor, but, a day after listening to it, I can't tell you anything about the melody.